Officially, Jose "Pepe" Marti was listed as trainer for the Postal Service cycling team. But those on the team knew him as "The Courier." One day while chatting with Tyler Hamilton, Pepe told the Postal Service surrogate that he had to drive to Nice, France, to make a delivery. That night, at the Villa d'Este Restaurant in Nice, Pepe arrived to a late dinner that included Lance Armstrong and his then-wife, Kristin, as well as Betsy Andreu, wife of Postal rider Frankie Andreu. According to Betsy, the reason given for the late dinner was because Pepe was there to deliver EPO (erythropoietin, a banned hormone that controls red blood cell production) to Lance and it was safer for him to cross the border with illegal drugs at night. After dinner was over, the Armstrongs drove Betsy home. At some point, she saw Pepe hand Lance a brown paper bag. As Armstrong opened the car door for Andreu, he smiled, held up the bag and said, "Liquid gold." On another occasion, as the Armstrongs and Andreus drove to a bike race in Milan, Italy, Armstrong stopped at a hotel/gas station outside Milan to meet Dr. Michele Ferrari, now infamous for supplying cyclists with performance-enhancing drugs. When asked why they were meeting him in such an odd place, Armstrong replied, "So the [expletive] press doesn't hound him." Leaving the other three in the car, Armstrong disappeared into Ferrari's camper for about an hour. When he returned, Armstrong exclaimed, "My numbers are great!" – the insinuation being he wouldn't test positive for performance-enhancing drugs. The next day, Betsy Andreu asked Kristin Armstrong about her feelings on EPO. Her answer: It's a necessary evil. Just three months later, Lance Armstrong won the 1999 Tour de France. All of this is according to the United States Anti-Doping Agency in a 202-page report which rips the sheen off Armstrong and exposes him as the greatest fraud in the history of American sports. No one with an objective mind can deny the damning facts uncovered in what amounts to a Mount Everest of testimony from witness after witness, all of whom point to Armstrong as the godfather of a sophisticated doping scheme aimed to accomplish one thing: win the biggest bike race in the world. Armstrong, through his attorney Timothy Herman, continues to maintain his innocence, claiming in a letter sent to USADA that the agency is biased against him and that some of the witnesses are "serial perjurers." For that to be true, however, the conspiracy would have to be as sophisticated and calculated as the "alleged" doping program itself. From Armstrrong's comeback from cancer in 1998 through his seventh and final Tour de France victory in 2005, his former teammates claim he used EPO, testosterone, human growth hormone, cortisone and blood transfusions. Among those making the claims are Hamilton, Andreu, George Hincapie, Floyd Landis and Jonathan Vaughters. While some of the information released in Tuesday's report isn't new, the scope of it is mind-boggling. There's the story from the 1998 World Championships in which a drug tester randomly showed up at Armstrong's hotel. Fearing Armstrong's hematocrit – a measurement of red blood cell count that cyclists consider the number between winning and losing – would test too high and thus prompt a positive drug test, Dr. Pedro Celeya, Postal's principal team doctor, ran to his car, grabbed a liter of saline, hid it under his raincoat, snuck by the drug tester and into Armstrong's room, where he administered the saline to Armstrong. There's the fascinating tale of Motoman, a personal assistant of Armstrong who became Postal's EPO delivery man during the '99 Tour. Fearful of keeping EPO on team buses, Postal used Motoman to deliver EPO-filled syringes after various stages of the tour. He'd ride his motorcycle along the Tour route, deliver the syringes, which Armstrong, Hamilton and Kevin Livingston would inject, often on the team bus just feet from the finish line. When they were done, they'd put the used syringes inside a Coke can for another team member to dump into a public trash can. There's the time Armstrong, going out of town, asked Floyd Landis to stay at his home in Girona, Spain not to house sit, but to watch the blood in his refrigerator. If blood isn't kept at the right temperature, it goes bad, and Armstrong wanted Landis to make sure there was no electrical issue while he was away. A few months later, six days into the 2003 Tour de France, Landis was called into one of the team doctor's rooms for a transfusion. When he entered the room, there were Armstrong, Hincapie and others already receiving their transfusions. There's the story about Armstrong testing positive for EPO during the 2001 Tour du Suisse only to have the test covered up after he made a $100,000 donation to UCI; the one about Armstrong telling Christian Vande Velde he had to "use what Dr. Ferrari had been telling him to use" in order to keep his spot on the Postal team; and there's the one when the team bus "broke down" between stages of the 2004 Tour de France while riders, including Armstrong, sat on the bus receiving blood transfusions. "[The report] is a sledgehammer," says Daniel Coyle. "It's so massive." In 2004, Coyle moved to Spain to write a book about Armstrong's attempt at a sixth Tour de France victory. In August, he released The Secret Race, a book that reads like a spy novel as he and Hamilton detail the race behind the race that is cycling's doping subculture. What The Secret Race reveals and the USADA report confirms is that cyclists put as much effort into their doping regimens as they do their actual training, which is saying something considering they spend seven days a week on their bikes. Despite the fact that most competitive cyclists were doping, Coyle contends that didn't create a level playing field. "The instinct fans have when they find out about cheating is everyone cheating levels the playing field. But when you look closely at this document and read the story Tyler tells in The Secret Race, you see the opposite is true. Doping distorts the playing field," he explained. "It transforms it from an athletic contest into a chess game of information and access. Who has the best doctor? Who has the best doctor exclusively if you're Lance? Who has the most guts? Who's willing to take the most risk? "Lance was the guy with the best information, the most guts, the most risk tolerance and access to the best doctor. He won that contest seven years in a row. He didn't invent that culture, but he beat them all at that game." USADA's report agrees, pointing out that Armstrong didn't act alone. However, it states, "the evidence is also clear that Armstrong had ultimate control over not only his own personal drug use, which was extensive, but also over the doping culture of his team. Final responsibility for decisions to hire and retain a director, doctors and other staff committed to running a team-wide doping program ultimately flowed to him." In his letter to the USADA, Herman called the investigation a "farce" and insisted that "fair-minded people will see whatever USADA issues is far from a 'reasoned decision' and is instead further evidence of the vendetta by USADA and its talebearers seeking publicity by targeting Mr. Armstrong." For that to bear out, fair-minded people would have to believe Hamilton corroborated with Betsy Andreu to concoct a story about Pepe driving to Nice on a random night in 1999; that Hincapie, Armstrong's self-described best friend in the peloton, is lying when he says Armstrong used his apartment for a blood transfusion; that 11 members of the Postal Service team used performance-enhancing drugs, but Armstrong wasn't one of them. "Two years ago, I was approached by U.S. federal investigators, and more recently by USADA, and asked to tell of my personal experience in these matters," Hincapie said in a statement released Wednesday. "I would have been much more comfortable talking only about myself, but understood that I was obligated to tell the truth about everything I knew. So that is what I did." 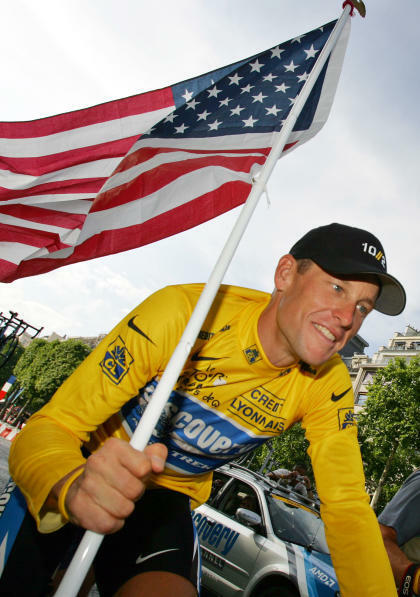 Unlike his 11 teammates, Armstrong will maintain his innocence because he has the most to lose. He was the main target of a two-year federal investigation into possible doping crimes by the Postal team. In February, prosecutors closed that case. An admission now by Armstrong could impact the status of that investigation. So the ruse will go on, if only inside Armstrong's head. For the rest of us, we now know a story that seemed too good to be true really was just that. • What is keeping Jets coach Rex Ryan from starting Tim Tebow?